Schott Distributing Co., Inc. supports the long term growth of sales, and share for all products. We will provide value added services to exceed the expectations of our customers, community, employees, and investors. We will develop a work environment that challenged every member to maximize productivity. We will achieve a level of profitability that will provide all Employees with long term financial growth and the owners with a fair return on investment. At Schott Distributing quality is more than a goal, it is a way of life. 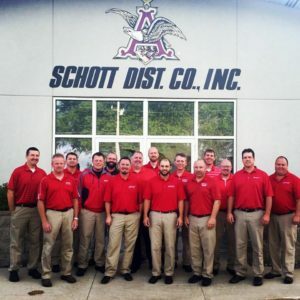 Schott Distributing Co., Inc. has done business since 1955 with an unwavering commitment to provide quality customer and Employee satisfaction and profitability. Customer Satisfaction– all Employees strive to provide a higher level of customer service. Social Responsibility– as a locally owned family operated business, we must be sensitive and responsible to the needs of the community and environment. Employees- our dedicated people are the key to our success. as a team, we work together with customers to ensure the success of our company. Profitability– our survival and growth are incumbent upon profits.